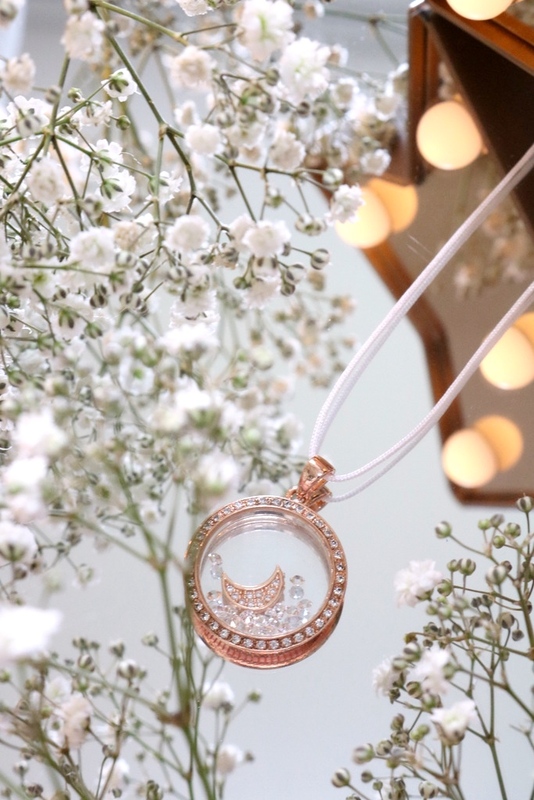 When it comes to jewellery and accessories I am always drawn to the same thing: rose gold and minimal; this necklace has a bonus point as it has a gorgeous celestial theme too! The lovely people at Bijou Bijou made my necklace dreams come true with this *Crystal Charm White Cord Necklace (£57) which is everything I'd ever want in a necklace! 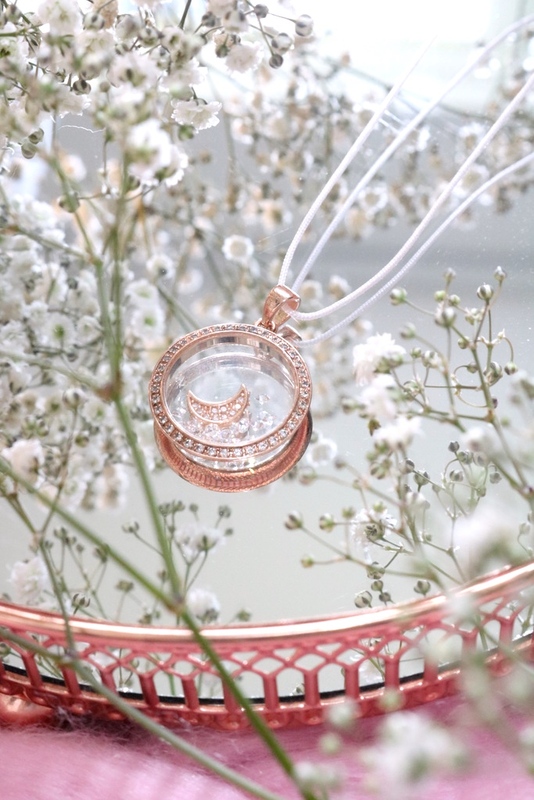 The necklace features a white cord with a stainless steel silver talisman in a gorgeous rose gold option with loose crystals and a cute little crescent moon within. They also have an option with a pink cord and silver talisman instead of rose gold but I thought that the rose gold version would suit my style more. I love the design, I think it is so pretty and it will be great for autumn! I love the little moon inside the necklace and how the crystals can move around; it's unlike all of the other necklaces in my collection. I like how it's quite a casual necklace with the white cord and minimal design. I've just been wearing it with light jumpers, jeans and ankle boots, it's great as an everyday necklace. Overall, I'm so happy with the necklace as it came nicely wrapped and presented, the design is just gorgeous and unique and the rose gold shade is perfect as sometimes it can be a little orange. I love the white cord rather than a chain and it's so easy to wear. Bijou Bijou isn't a brand I've heard of before but I'm definitely going to be checking out their website from now on! What do you think of this necklace? Have you bought anything from Bijou Bijou? Autumn is about a month away and I'm beyond excited! I'm looking for autumn photography props, I'm planning my halloween looks and I've already started bringing out my autumn wardrobe as I'm currently in Norway as this is being posted. Autumn is my favourite season, period but one of the main reasons is because I get to wear jumpers, knits, boots, jeans and cosy fleece leggings all of the time and when I do that during the summer months, I get strange looks. The transition between summer humidity and chiller more autumnal and rainy days can be difficult especially in England where you seem to need a summer dress, winter coat, umbrella and suncream in just one day but here are a couple of gorgeous items from the lovely people at Joanie Clothing that are perfect for the summer to autumn period. The pink version of this dress caught my eye initially as it's just gorgeous but I prefer darker colours on me rather than lighter shades as I think they suit my dark hair and pale skin but more than pastels. I have the 'tap shoe black' opinion in a UK 10 which is a perfect fit for me so I'd say it's true to size. The dress has a lace overlay which extends over the arms, hem and the back, it's a really unusual but simple dress. I love the style as it covers my arms, it is fitted but not overly so and it looks formal and classic but without the effort. It's such a comfortable dress and not too long either even on me and I'm very petite. I'm definitely going to be taking this dress on holiday and by the time your reading this, I've probably already worn it on one of the black tie evenings on the ship. 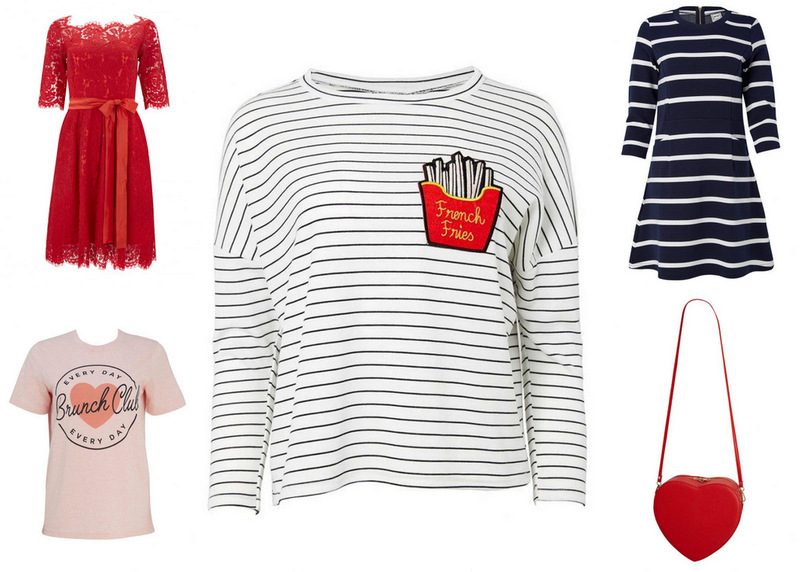 The first items from Joanie Clothing that I noticed on Instagram were their gorgeous jumpers and tees as they're so unique and so cute! I especially love this almost nautical style jumper with the slogan 'Salut les Copains' on the front which I think means 'hello friends' in French (I studied German in school so I've no idea!). I love the style of the jumper as it's slightly oversized, it's so comfortable and cosy and it pairs with jeans so easily. I love the material as it's so soft and perfect for slightly chilly summer days and for the start of autumn. It's another item I'll definitely be taking to Norway with me as I think it's going to be quite chilly! I couldn't be happier with both of the items as they are perfect for the upcoming season and my upcoming holiday, although it will be ending by the time your reading this! You will be seeing these again in my cruise photo diary posts that I'm planning for the week I get back, if I'm organised enough so stay tuned for more outfit photos (unless it's constantly pouring down in Norway) and lots of photos of the Norwegian fjords! What do you think of these gorgeous items from Joanie Clothing? Have you bought anything from them? 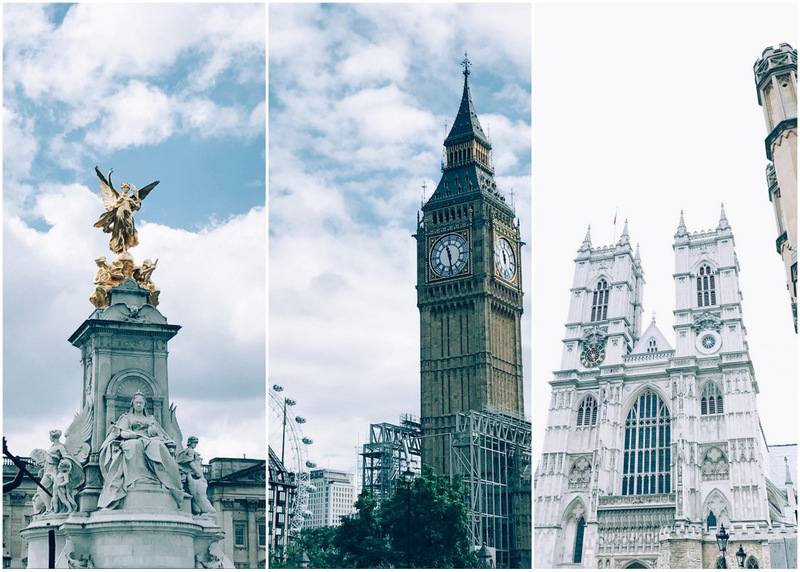 I was lucky enough to visit London for my birthday this month (you can check out my London photo diary post so you want to see what we did in the beautiful city of London) and I'm setting off for Norway later this week too! I haven't had to do so much packaging in the space of a couple of weeks and that makes me a little nervous as I always overpack and worry that I haven't taken everything I need. Here's a sneak peek into my bag and what I took with me to for a weekend in London (I'll have a separate post about my makeup/skincare for Norway), including a few necessities, beauty essentials and snacks. Let's start with the basics, I have my gorgeous maroon Kate Spade purse and my equally gorgeous rose gold iPhone 7. When I went to London, I didn't take my massive Canon 750D and lenses, I just took my iPhone 7 and I'm surprised at how well the photos turned out although I will be taking my DSLR to Norway. I also have my trusty Rayban Erika Sunglasses which came in so handy in London as the weather was gorgeous. For the snacks, I took a packet of the very moreish *Mighty Fine Honeycomb Dips (£3, 90g) in the salted caramel flavour to London with me and it was delicious but for Norway, I'll be taking the milk chocolate option as I adore milk chocolate. We have a long train journey to Southampton and then back again so they will keep me going and they don't make any mess on the train. I also have the dark chocolate flavour that I might take too as I know everyone will want to try these and they're such an incredible moreish snack, you can't just have once piece, you have to eat the whole packet! Highly recommend! I do tend to take some beauty items in my bag but most of it will be in my main luggage; however I'm one of those people who has to have 'emergency' beauty items in every bag just in case...I get it from my mum as she is exactly the same. I was kindly sent a massive box filled with essentials and travel necessities from Chemist.co.uk and I'll be taking some of the items to Norway including the mini dry shampoo, wipes, multivitamins, razors, plasters and other essentials which you'll see in an upcoming post. I'll also be taking The Body Shop Almond Milk & Honey Hand Cream, Merci Handy Face Mist and mini perfume samples, as emergency items. What essentials do you keep in your bag? What are your travel essentials? I'm one of those people who isn't really a lover of cake, biscuits, cookies or chocolate *I can hear the gasps, I know* and I don't know why! Sure, I like sweets and desserts every once in a while but I never really crave things like cake, biscuits or chocolate and I think one of the reasons is because I've never found any that I really like. There's maybe only one brand of chocolate that I actually like and even that is rare but when I see chocolate that is packaged as uniquely as this and that sounds as delicious then I have to try it and sadly for my scales, I love it! I was very kindly sent a selection of chocolate from Love Cocoa which focuses on award winning luxury chocolate bars and gifts that are handmade in the UK, made using only organic, fair-trade ingredients and with the ethics of the original Cadbury company - the founder of Love Cocoa, James Cadbury, is a descendant of the founder of Cadburys so it seems that delicious chocolate making is in the genes. Firstly, let's mention the gorgeous packaging! It's so minimal but so eye catching and I think aesthetically it would make a fantastic gift. The 70% cacao dark chocolate derived from Ecuador is combined with handpicked crushed sea salt from the UK. Sea salt and chocolate isn't an original or shocking combination as it once was but it's become a classic, especially as a gift and this one is definitely the best I've tasted! I love the rich, smooth dark chocolate and the savoury saltiness. If I'm going to reach for any chocolate then it will definitely be milk chocolate, I love how creamy it is but nothing compares to how intensely creamy, milky and utterly delicious this decadent bar is! I adore the honeycomb as it adds sweetness and a slightly difference in texture, it is also just so moreish. I am going to Norway tomorrow and if it wasn't for my holiday then all of the bar would have been eaten already. It's one of the most delicious and indulgent chocolate bars I've tasted and I cannot recommend it enough! This bar also has my favourite packaging design of the four that I was sent and the chocolate bar itself looks so unique when opened with the honeycomb shining out of the chocolate. If you follow my instagram stories then you'll see just how much coffee I drink so a coffee chocolate bar is perfect for me! The 70% chocolate from Ecuador is mixed with crushed coffee beans from Pact Coffee. As with the honeycomb bar, the look is interesting with the coffee beans almost crushed into the chocolate. Coffee and chocolate is such a delicious and sophisticated combination, it's rich and dark with bitter coffee beans that I adore. I also love the crunch from the coffee beans against the smooth luxurious dark chocolate. Lastly, the 70% chocolate from Ecuador which seems to be the home of gorgeous chocolate! Dark chocolate on it's own isn't what I'd usually go for as I prefer something a little sweeter or with differing textures although it is a very smooth and rich dark chocolate that I think will be a favourite for so many people. As with the other bars, the packaging is gorgeous and makes the bars seem extra special so I think they'd all make wonderful and slightly more unique gifts *should I mention the C word...*. Have you tried any chocolate bars or gifts from Love Cocoa? What do you think about the packaging and flavours? Last month I became a DegustaBox ambassador and I received the July 2017 box which was amazing so I couldn't wait to receive the August box. As with all subscription boxes, one of the main points I love about them is the mystery of what I'll receive; subscription boxes to me are the adult version of those Claire's Accessories goodie bags from the 90's! Each months box contains between 10 to 15 food, drink and snack items which I think is fantastic considering the low price and if you use the discount code KVAA2 it will make the box only £5.99 instead of £12.99. The August box contained so many nostalgic items in it as well as some of my guilty foods. I used to love jelly growing up but as it typically contains gelatine (which isn't suitable for vegetarians), I haven't had jelly for so long...until now! I was so happy to see that both of these jelly products were gelatine free and even though they are probably for children, I'm still eating them! I've tried the Apple and Blackcurrant flavour and it's so sweet and moreish. I also received an orange flavour in my box. Speaking of gelatine and nostalgic sweet treats, Refreshers were some of my favourite sweets in primary school. Now they have giant refresher sweets that are soft, fruity and frizzy but sadly they do contain beef gelatine so I won't be eating them but I know my friends will! I think I received some of these biscuits in a previous box but I love this brand so it's fine! These biscuits are milk chocolate flavoured with white chocolate in the middle and I can't wait to try them but it will have to wait until after holiday. This box was not very well timed as it's only a few days until my holiday to Norway. 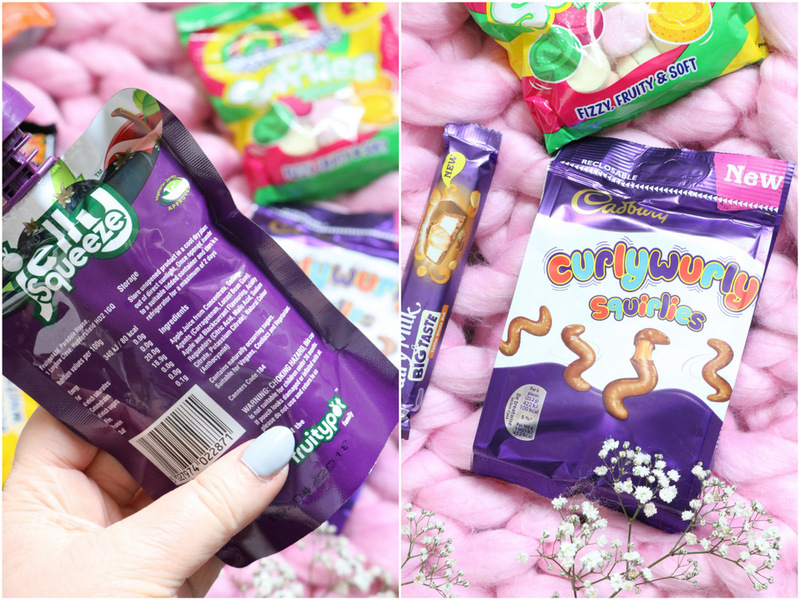 Another very nostalgic product as I used to eat CurlyWurly bars growing up - they were so moreish while simultaneously glueing my teeth together. Again, it will have to wait until after holiday because I'm trying to be very good...I'm actually succeeding *mostly*. I haven't had any Dairy Milk chocolate for so long and I love anything toffee flavoured so this is perfect for me! It's from a new range and I think I will actually take it with me for the long train journey to Southhampton later this week as it will be a very early start and a very long day! Now we're onto the savoury snacks and they are healthy too! I received two bags of soya and chickpea chips from lighter life. I have the pesto and sundries tomato flavour and the sweet and smoky chipotle flavour, both of which taste so nice and they contain less than 100 calories each. I've tried a few things from this brand and liked them so definitely check it out! Another item I'll be taking on the train (this box was both great for the upcoming holiday and awful for the upcoming holiday!). The drinks come in the delicious original and a light version and they have cute summer limited edition bottle designs too. Sticking with the summery theme, this ready to serve drink is perfect for summer as it contains ginger, coconut and lime! I also love the packaging and it only contains 90 calories which is amazing. When friends come round, I'll be buying a few more! We're onto the last few items (there were so many in this month box!) and it's something I haven't tried before. I'm not a fan of very spicy food but I do like jalapeños so this hot sauce as it is milder is perfect for me. I'm going to be making vegan tacos very soon so I'll definitely be adding some of this. For me personally, there have only been two items in this box that I am not 100% happy with and those include the Refreshers sweets as they contain gelatine and this one...I can't be the only one who thinks that mayonnaise is just disguising, right? Just me? OK.
Last but not least, my guilty food pleasure. We all have foods that we adore but that aren't healthy, nutritious or even acceptable in modern society and for me, that is buttery, salty instant noodles - they're so delicious. I've only had this box for a couple of days now and I've managed to eat both packets...I have zero willpower when it comes to noodles. Oops. Overall, I'm really happy with the August box as it contained so many yummy snacks, drinks and chocolate, all of which will be gone a few days after I come back from Norway as I only have so much willpower. If you like the look of this box then use the code: KVAA2 to get it for only £5.99 which is an amazing discount! What do you think of the August Degusta Box? Have you tried any of these items? It's coming to the end of summer now and autumn is almost here which is making me want to buy all of the autumnal homeware and candles! Autumn is my favourite season as it's so cosy, jumpers are compulsory and it is acceptable to bake and eat constantly. I'm not a fan of summer homeware, it's too bright and colourful, I definitely prefer autumnal homeware and I was recently sent some lovely items from Rooi Home, Dandelion Interiors and Melody Maison. I've wanted to try Paddywax candles for the longest time but I always put it off so I was very excited to receive these cute candles in the post. I have 'applewood and amber' and 'amber and smoke', both of which are small 2oz candles. I love the packaging, they're so cute and there are so many options to choose from. Let's start with the 'applewood and amber' scent, I don't really have a favourite as they are both gorgeous but to me, this one smells like christmas, apple pie and potpourri, it is amazing. The scent is so homely, cosy and autumnal/wintery which I love. As the candle is small, it burns evenly, there isn't any tunnelling and it smells amazing. The scent throw isn't incredible but it's really good and they are both making me wish it was autumn even more now. Next up the 'amber and smoke' scent which is pretty much bonfire night in candle form and who wouldn't want that! It is smokey, deep, woody and rich, I think it might be one of my favourite candle scents ever. I could smell it all day, it's that good and again as it's small, it burns well and evenly. I cannot recommend these candles enough, definitely check out Rooi Home! If I could sum up autumn in homeware items, candles, blankets and fairylights would be at the top of the list. Fairylights, as well as candles, can make any room look instantly cosy and inviting. That's why my second favourite is this gorgeous battery powered lamp from Dandelion Interiors that I received a while ago and I've been loving it since. The lamp features a large glass dome, heavy base and a connected string of copper fairylights inside. The dome can be removed and that's really my only negative as I have almost dropped it a couple of times as it isn't connected to the base at all but apart from that it looks amazing. The fairylights are a mix of yellow and almost pinkish hues which I adore and the lamp looks so victorian, as though it should belong in a dusty library or apothecary. I love that it is battery powered as it can be moved around fairly easily and it has a handy on/off switch on the back rather than under the base. I couldn't be happier with it! 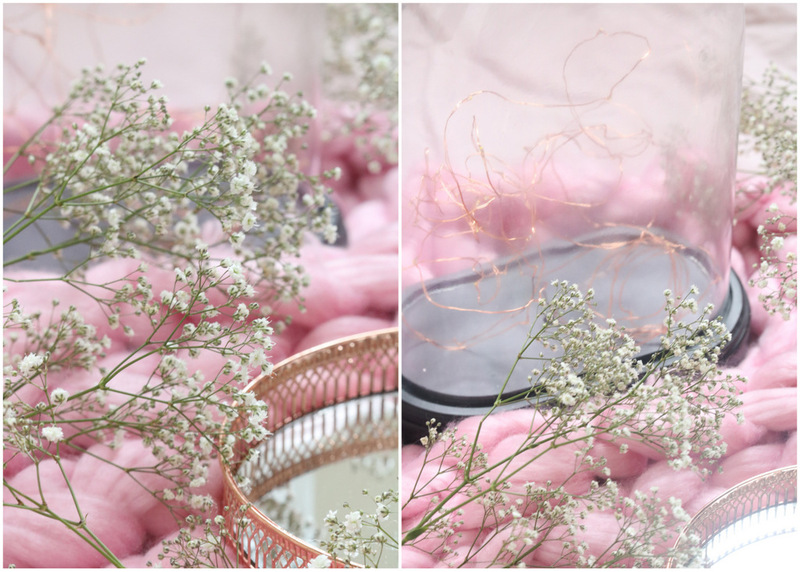 Lastly, this gorgeous copper mirrored tray has been a favourite recently and it's working well as a blog photo prop too and you'll see it in an upcoming post or two! It's from Melody Maison who I have worked with before as I received an equally gorgeous copper clock from them a few months ago. I think it would also be great for storing and displaying fragrances, makeup or candles too. What homeware items or stores are you loving? Have you bought anything from Rooi Home, Melody Maison or Dandelion Interiors? Buying for your other half or anyone who is a little picky can be tricky, especially if you feel like you’ve exhausted all your options. Trying to think outside the box and come up with quirky, novel ideas is hard enough without also factoring in a budget and finding something that they’ll actually like. 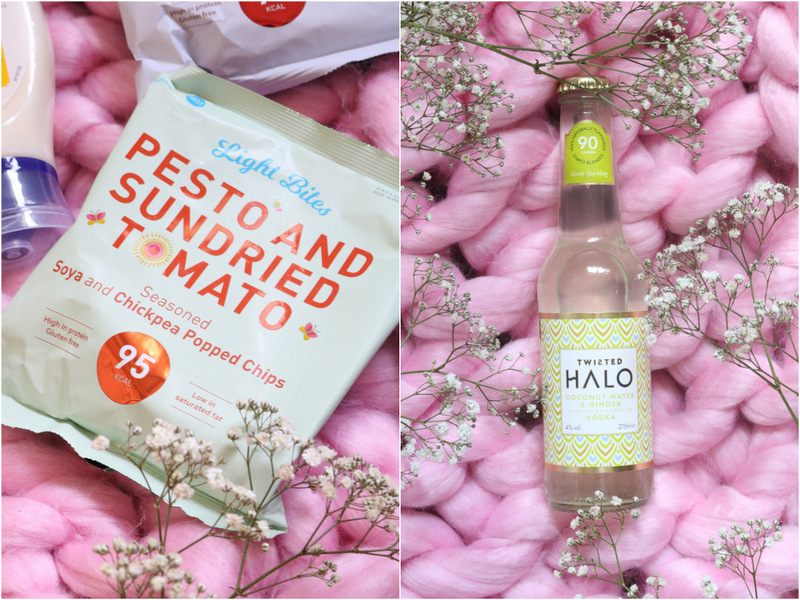 If your partner has got a birthday coming up or you’re super organised, and you’re already starting to plan for Christmas *I know I am...*, here are some tips to make shopping simple. When your other half gets paid, what do they spend their money on? What do they devote their spare time to? If they had a day off work, what would they do with those precious hours? If you can answer these questions without hesitating, it should be easy to find presents they’ll love. If they enjoy shopping and they’re always on the lookout for trendy new additions to their wardrobe, you could treat them to a shopping spree, choose a new shirt for the collection or go for something unique like some customised trainers. If they’re a food and drink connoisseur, you could order a personalised hip flask, put a hamper of all their favourite treats together or even book a wine tasting class. If they’re a mad footie fan, you could order a signed shirt or book tickets to go and watch a game together. Think carefully about what they love when you’re coming up with ideas and this should stand you in good stead. Shopping for a partner can be really tough, and sometimes, it’s impossible to break the mould of socks, trainers, and aftershave if you restrict yourself to items that you can physically buy in a shop. Instead of buying a mountain of things, why not make memories and gift your partner an experience, a weekend away or even a romantic holiday? Depending on your budget, you could go glamping in the meadows, hire a beach hut for the day or channel your inner adventurer and escape to a national park for a weekend. You could put your feet up and relax with a spa break, set their pulse racing with a track day or get dressed up for a day at the races. 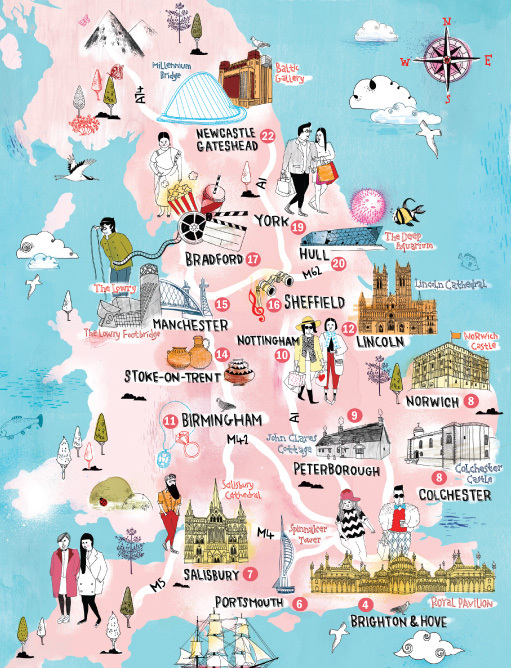 I cannot recommend visiting Chester and York enough as well as the bustling city of London. Shop around for deals and discounts online. It’s particularly beneficial to compare prices if you’re booking trips, flights or hotels. If you can’t narrow down the options, you could create a collection of dates or trips. Use numbered mini envelopes to provide details of each date. You don’t have to crazy and spend a fortune. You can mix and match days out or a night away with simple things like a night in with a takeaway and a DVD or a picnic in the park. When it comes to buying gifts for your other half, you want to show that you care and you’ve put a lot of effort into present buying. If you find shopping stressful, hopefully, this guide will give you inspiration and help you to come up with some ideas your partner will absolutely love. What are your favourite kind of gifts to buy for others? What are your go-to gift ideas? The customs fees are rumoured to be terrible for some unlucky orders and after searching around and talking to people who've made orders, it seems that if you order is less than £15 then you won't have to pay customs fees and thankfully my order came to less than £10 and I didn't have to pay any customs fees *yay*. My order came really well packaged (maybe too much packaging) from LA and it took about ten days to get to me since I ordered. Another point to mention is that I used PayPal to pay for my order and I think that helps to reduce the risk of customs fees but I'm not sure. I ordered three of the ColorPop Ultra Satin Lip ($6 each or 3 for $12) which are long lasting liquid lipsticks in the shades: Echo Park, November and Lost, although there were so many others that I want. I adore the packaging, they don't really have a scent and I'm so happy with the three shades that I purchased, now I want to make another order. 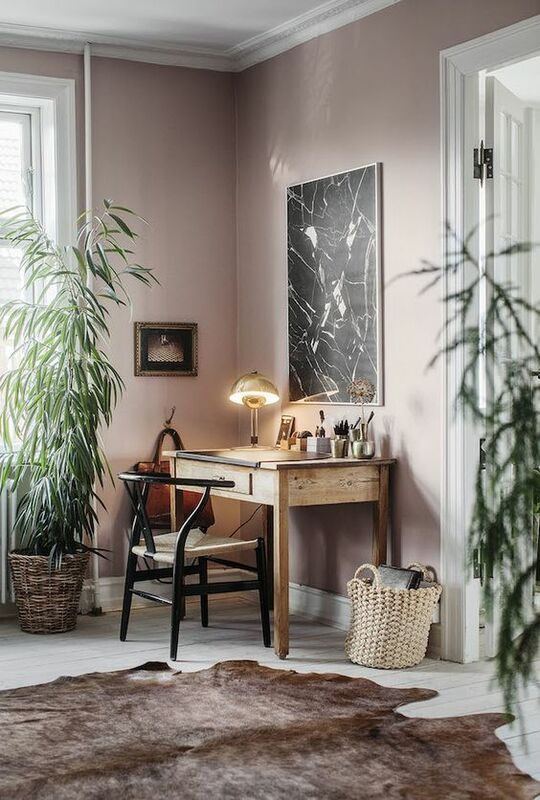 This is the shade that seems to be one of their most popular shades and I can definitely see why as it's a lovely natural neutral pink shade with brownish undertones. It is a 'my lips but better' shade that I cannot stop wearing. It's a perfect everyday shade, it has such a smooth and comfortable formula and glides on well with a creamy, pigmented finish. Unlike their matte formulas, these have a satin finish so they don't look or feel too matte. I cannot recommend this shade enough! This next shade is is one of the Kathleenlights x ColorPop shades, it must have been a collection. It is a warm pink shade that is a little brighter and pinker than I usually wear but it is gorgeous and just perfect for the spring and summer months. The formula is so creamy, they all feel light and comfortable on the lips and they are all incredibly pigmented. The final shade is a rich classic red shade which comes in so handy for making any simple look a bit more polished and put together, especially for blog photos. The only negative about this shade is that as it is much darker and bolder than the other, you can't hide when it comes to mistakes - the fuzzy applicator can make the edges a little less shape and neat which is annoying as otherwise it would be the perfect red. Overall, I couldn't be happier with my ColorPop order as it came quickly, I love the packaging and the price as well as the fact that I didn't have to pay customs fees! The two natural shades are perfect and I have been using them so much since I received them but the red is a tiny bit disappointing but still definitely worth a try as they are so cheap. Have you ordered from ColorPop? What do you think of these shades? Okay, so you’re getting people reading your blog and interacting with you! You may think that all the hard work is done now and you can relax,but the truth is the hard work has only just begun. You have to continue to work hard to keep your blog popular and up to date, if that's what you want for your blog. It’s difficult to know how to go about this but if you carry on reading you’ll not have to wonder! This is one of the most important things when keeping your blog up to date and interesting. This can all be avoided if you change your content up every now and again. If you’re a beauty blog, write something that is still linked to beauty but slightly different, perhaps linked in with a similar hobby. This keeps your audience engaged, maintaining what you have earned! There is very little guidance with this purely because it depends solely on what you’re going to be blogging about, so do whatever you see fit but new and exciting content will always be well received. Photos can’t be used to completely make up your blog, rather they are a force multiplier, they make what is already there much better. Photos can either enhance a post or be a post all in itself as it is able to convey a simple message without any explanation! It’s good to learn how to take proper photos and selfies due to how personal blogs can be, so read this selfie guide by MyTrendyPhone to give you the knowledge you need to take the right selfies! Getting it right means that your blog posts are going to be much more eye catching. Giving away products that you enjoy can really boost your audience. People are always after free things, and if you're going to host a giveaway you can turn it into a competition and make up the rules yourself! Of course it has be legal, so read this on how to achieve a legal and safe giveaway. Giveaways attract attention because people like free things, and if you put on the giveaway that there are certain conditions to enter such as sharing the post on a social media site, you can get free advertising out of it and a little boost to your followers which doesn't hurt - this is a bit of a controversial topic within blogging but I'd say that you should go for it. By hosting giveaways to potentially attract more readers and by posting interesting and new content on your blog, it will keep your online space unique and current. Of course there is an art to taking photos, especially when it comes to festive ones to fit the season, so read my guide to learn how to do it. What do you think of these tips? Do you have any blogging or photography tips? What have you learnt from blogging? If you follow me on Twitter or Instagram then you will have seen my photos and video clips of my trip to London earlier this week! I went with my parents and one of my aunties on the 14th and the 15th, the latter was my birthday! We stayed in the London Euston Premier Inn which is so incredibly affordable, the location is amazing, there were vegetarian options and it was so clean - the staff were also so helpful, I'd definitely recommend it. We traveled down with Virgin Trains from Manchester and it's my first time on Virigin Trains; it was fantastic, we had a table each time and it puts other train companies and quality to shame! 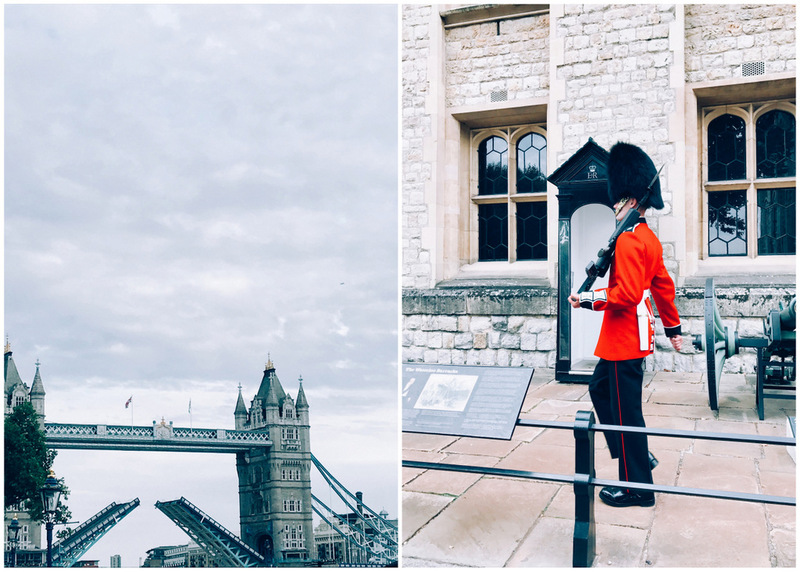 On the first day we took the tube, which was a bit of a nightmare as we didn't know what tickets to buy and my contactless card wouldn't work at the barriers but we eventually arrived at the Tower Hill tube station and walked over to the Tower Of London. Tickets were a little expensive but in my opinion it was definitely worth it! We decided to wait and go on a tour with one of the yeomen of the guard which I'd definitely recommend as our guide *Steve* was so funny but with so many people in the group, it was a little difficult hearing everything. The tour was only an hour or so then we explored the white tower, the bloody tower and we saw the crown jewels! 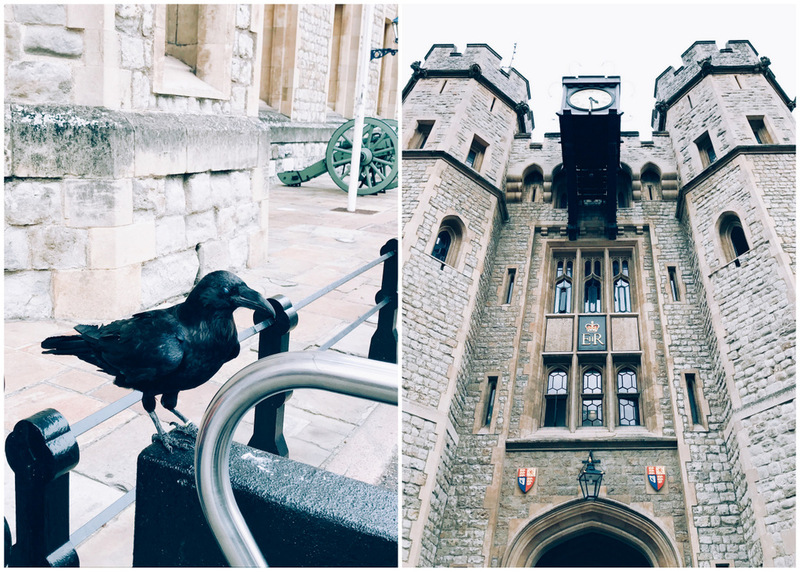 As we were queuing up to look at the crown jewels, one of the famous ravens that live at the Tower Of London came right up on the railing where we were standing which was slightly frightening! It was amazing to walk around and we went inside the chapel where Anne Bolyn is buried too. I think if you do want to see everything at the tower and go on a tour then it will take up at least half of your day as we were there until the closing time. From the Tower Of London you can see the Shard which was amazing as you get the view of the 900 year of tower and buildings with the modern buildings soaring overhead. Inside the white tower there are amazing displays of royal suits of armour, weapons and more so it's well worth going inside. They had suits of armour that Henry VIII wore! 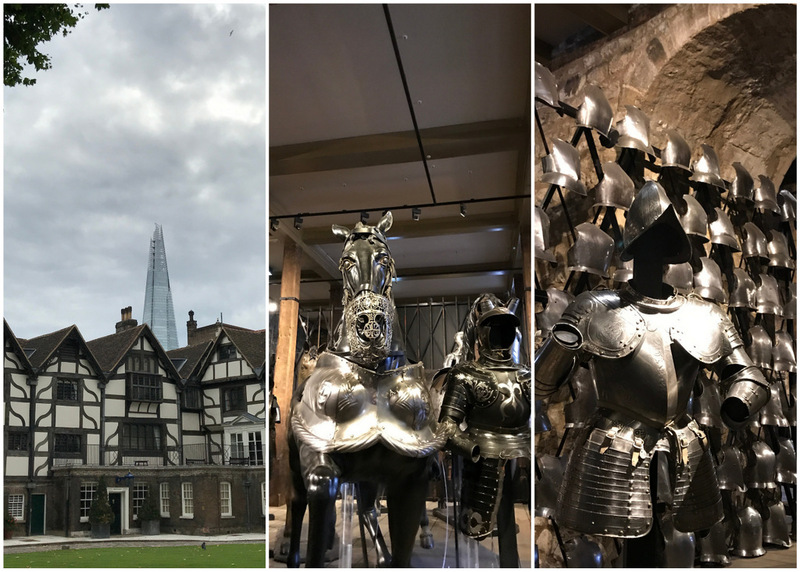 Even though my feet were absolutely killing me *literally every step hurt*, I couldn't recommend visiting the Tower Of London enough and especially the Yeomen of the Guard tour as well as it's so informative and funny. Seeing the crown jewels was incredible, the displays inside the towers were too and despite the number of people, it was easy getting around, we didn't have to wait too long queuing and it was an amazing thing to see (it's definitely not enough to just see it from the outside). You can also see Tower Bridge from there too and it's a short walk to Tower Hill tube station. The next day we took the Victoria line from London Euston to the Victoria tube station as we wanted to see the houses of parliament, big ben and Buckingham Palace as we had a tour booked for later that day. I also wanted to go inside Westminster Abby but the prices were a little high, the queues were insane and you weren't allowed to take photos inside anyway so we didn't bother and walked to see Big Ben, Parliament and House Guards Parade and then came to St James Park which is a park I haven't been in before but it's definitely the nicest and most relaxing park in London. 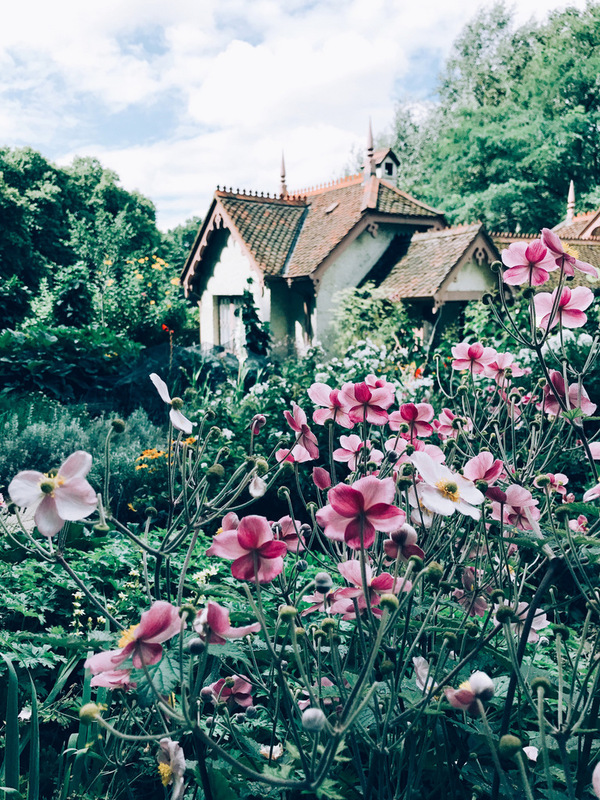 There was a little Swiss looking cottage in the park with vegetable patches outside, lakes and a water fountain as well as so many beautiful flowers. We stopped at the cafe there and if you are looking for something to eat then definitely check it out as there were so many options and the location is fantastic. You wouldn't expect such a relaxing and quiet space like that within central London. The final stop we had was a tour of Buckingham Palace which we booked a couple of months before and for four adults, it was about £90 and we went through 19 state rooms and the gardens. Before we went inside Buckingham Palace, I expected it to be a tour of about 2-3 hours with a guide taking small groups around but instead we were all given headsets with videos to listen to as we walked around the massive state rooms which was unexpected and I wasn't a fan of that style of tour! Around a quarter of the way through the state rooms, I took of the headset and just walked around reading the plaques as it was so annoying having these headphones on and trying to watch a video while looking around. Also my feet were so incredibly sore so in pretty much every state room I had to sit down (thankfully there were benches set up in almost every state room). As you walk around at your own pace rather than with a guide, you can take a while or as we did, you can move through at a normal pace (with the headphones on you are pretty much at a snails pace) and we were finished within about 70 minutes. We headed to the gardens where there is a shop and cafe, both of which were quite busy. The cafe had lovely views, the weather was so nice for the two days we were in London and I had strawberries and cream although on the website it shows macaroons but there weren't any *I did want a macaroon on my birthday but there wasn't a lot of choice, in my opinion* and the prices were ridiculous! The gardens were so gorgeous and on the way out you get to see more of them but the last part of the day was pretty much ruined for me as I felt so physically sick (I think it was the heat and tiredness as I hardly spelt thanks to snoring) and my feet were so painful. I felt like I was either going to throw up or faint which wasn't a pleasant end to a lovely trip but thankfully we got a taxi to the hotel and it took us down The Mall, Regents St and some of the most exclusive and fancy streets in London. 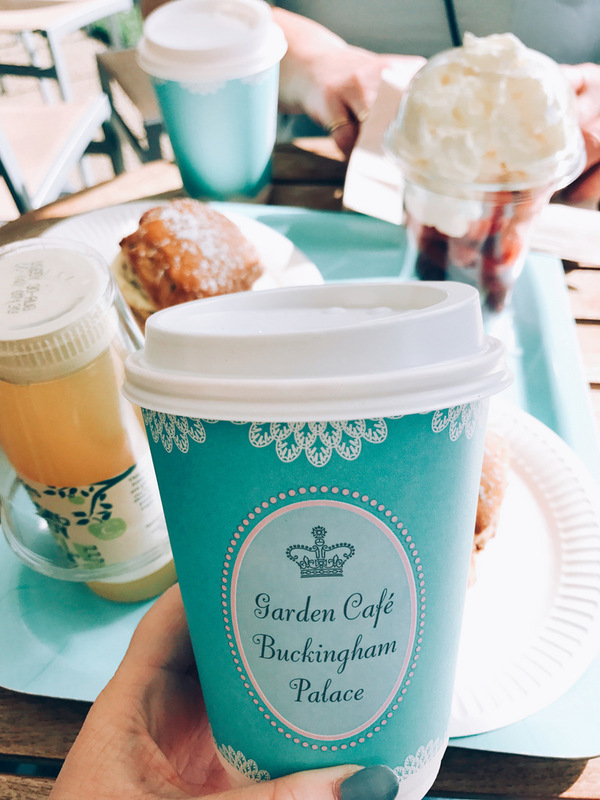 Overall, I had an amazing time, we saw some incredible historic sites, Buckingham Palace was amazing, the weather was great and the hotel/train were both perfect. The only downsides were the prices, my ridiculously painful boots and not knowing what tickets to buy for the tube (the staff were great but there were only a couple of people around to help with lots of customers waiting around not know what to do!). I cannot recommend the Buckingham Palace and Tower Of London tours enough, I can't wait to visit again albeit with comfy boots! Have you been to London? Have you visited Buckingham Palace or the Tower Of London? I have been a fan of Bomb Cosmetics bath products for a few years so I'm very excited to announce it's that I'm one of their brand ambassadors! The first product I tried from them was the Violet Bath Mallow which was so impressive as it lasted for so long in the water, it looked so cute and the scent was amazing! I was very kindly sent an amazing package from them including some of their new products which came in rainbow coloured polystyrene - it was a very colourful package to brighten up a dull rainy Saturday. I've tried a couple of the products so far and I love them so I can't wait to share my thoughts. If you follow me on Intstagram then you will have seen the unboxing and the demo of the Cherry Bomb Blaster too. It's my birthday today! The package contained so many amazing smelling products and the first one I gravitated towards, as it was so cute, was the *Bomb Cosmetics Cherry Bomb Blaster (£2.99) which is a new product! It smells like sweet cherries but it isn't over powering which some cherry scented products can be. It looks so adorable and it contains bergamot and cedarwood essential oils. Bomb Cosmetics has a range of bath products including bath mallows, bath melts, bath creamers and bath blasters, which is what I have here. It's basically a cute bath bomb and the others are much smaller and somehow even cuter! It fizzed away fairly quick, it left a slightly tinted bath and the scent was subtle. It is the first bath blaster I've tried from Bomb Cosmetics and it was quite impressive. Another product that I've already tried is the gorgeous *Bomb Cosmetics Hand In The Cookie Jar Hand Treatment (£4.99, 25ml) which is honestly one of the nicest hand creams I've ever used. It comes in a L'Occitane style tube which makes it great for travelling and it smells so nice! To me it smells like vanilla, coconut and sweeter fruity notes which I love and it's subtle too. I use hand creams constantly as I have eczema on my hands which makes them perpetually dry and sore and most hand creams leave some kind of greasy look or feel to my skin but this doesn't. It is incredibly moisturising, smoothing and nourishing but it does make my hands feel greasy, oily and sticky in anyway at all which impressive! Next up their almost iconic soaps of which I always see in more boutique and smaller beauty or home stores. The one I received is the *Bomb Cosmetics Summer Cherry Handmade Soap (£2.99, 100g). The soaps are so striking as they have various colours and opacities within them which looks so unique and interesting. The 'summer cherry' scent is sweet and fruit but again it's not overpowering or cloying. It works really nicely as a hand soap as it lathers, it smells lovely and it doesn't irritate or dry out my skin. Now onto a very exciting and very unique product that I haven't seen anywhere else! The *Bomb Cosmetics Shower Mixers (£1.50 each) are giant fizzy tabs that you place at the bottom of your shower and they fizz away with the water releasing a gorgeous scent. I think they are amazing for those who want a bath bomb but who don't have bath tubs, these solve that issue! I have the Vanilla Shower Mixer with Nutmeg & Ginger essential oils which looks like a giant pill and smells so musky and lovely, the Cookie Shower Mixer with Nutmeg & Cinnamon essential oils that almost looks like a cookie with sprinkle in it and the Cherry Shower Mixer with Lavender & Marjoram essential oils that might have my favourite scent of the three. Another shower based product is the *Bomb Cosmetics Vanilla Shower Butter (£7.99) which is an unusual product as it's basically a rich, semi-solid body wash that has a really creamy consistency. I don't think I've used anything quite like it before! I like the cute, ice cream tub packaging and the scent is so delicious, I'm tempted to eat it...I won't! The scent is me is a mix of vanilla ice cream, caramel and bananas, it has a rich texture and is quite unusual to use. It does lather slightly and leaves the skin feeling squeaky clean, smooth and moisturised. Last but not least one of the most impressive little bath products ever! The *Bomb Cosmetics Mon Cheri Bath Mallow (£2.99, 50g) which is a new addition to the range. I haven't tried this yet but it's so cute so I can't wait. I'll always share videos of the products in action on my Instagram Stories. Have you tried anything from Bomb Cosmetics? Essence has been one of my favourite brands for the past three or so years, since I was invited to the brand launch in the UK! The event was amazing, I received an incredibly generous goodie bag and met some lovely bloggers; it also started my love of Essence! 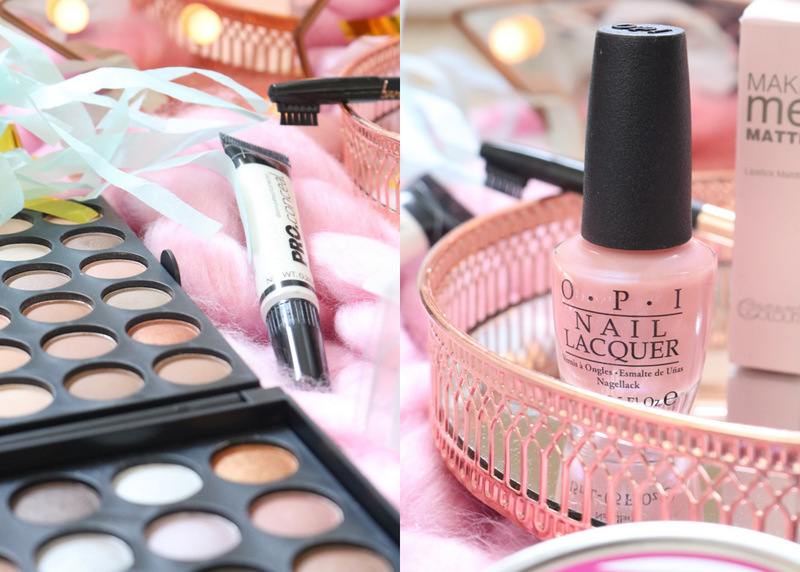 The brand recently celebrated it's 15 birthday which is amazing and I was very kindly sent a gorgeous box filled with party hats, confetti, sweets, balloons and of course, Essence makeup which made a dull monday morning much more exciting. Today I wanted to share some of my favourite products from Essence over the years as there are so many and they are well worth checking out! My favourite product by far is the fantastic Essence All About Matte Fixing Compact Powder which I've gone through at least two of already and I'm now on my third. The powder just makes my skin look amazing and it helps to keep my makeup in place all day - if you only buy one thing from Essence, make sure it's this powder! Another favourite is more of a category of products and that's mascara. I've tried so many mascaras from Essence and they are all fantastic. They are so inexpensive, they work really well and I particularly love the waterproof mascaras in their range. I'm now using the Essence Volume Stylist Mascara which I'm loving. Another category is lipsticks and while they aren't the most long lasting, they are so comfortable, inexpensive and pigmented. The same goes for their eyeliners, I love the Liquid Ink Liner and the pencils too. Lastly, I have to mention their nail polishes which are so fantastic and pretty much everything I look for in a nail polish - pigmented, easy and quick to apply, great shade range and as with everything from Essence, they are so cheap! Here's a short video of the amazing box of goodies and some swatches too! Have you tried anything from Essence? If so, what are your favourite products? I posted about the kitchen redesign a few months ago and now it is finally finished with amazing oak doors, grey walls and gorgeous pearlescent wallpaper from Inspired Wallpaper. We do have some photographs hung up in the kitchen as well as the star certificate but there was one wall that was completely empty, until now thanks to the lovely people at Hello Canvas. I was very kindly sent the *Hello Canvas Vintage Blue World Map (£46 - SALE) which is the full colour and 36x48 inch version, without a floating frame. They come in numerous sizes but I chose the largest as the wall I wanted to hang it up on was quite large and I thought it would be the best option to fill the full space. You could also choose various colour options but since our kitchen is mainly oak, cream and a blue toned grey, I thought the blue, creamy and grey tones of the map would match well in the kitchen and I think it does - I love the way the map is a feature in the kitchen and how well it blends in. I also love the white boarder around the canvas, it makes it look a bit more formal and finished off, if that makes sense! It's surprisingly heavy but it was easy to put up on the wall as it comes with a small tool to attach to the canvas frame that allows it to hang on the wall easily. It only took a few minutes to measure the frame, attach the plastic, hammer in the nail and hang the canvas. I think it looks amazing in the kitchen! The canvas also comes with red flag pins that can be used to mark on the map the places you've visited which I think I will be adding to the map. I've been lucky enough to visit many european countries including Sweden, France, Spain, Greece, Italy, Ireland, Slovenia and many more; also we are visiting Norway later this month so I can add it to the map as well. I couldn't be happier with the map as it looks amazing in the kitchen, it fits so well and it makes the room look more homely and lived in rather than having an empty space on the wall. The delivery was also quick and I couldn't recommend Hello Canvas enough. They have various options to choose from, not just maps but also framed photos, printed canvases and you can even have photos printed onto metal and wood which I think would make a great gift! Have you bought anything from Hello Canvas? What do you think of this canvas map? 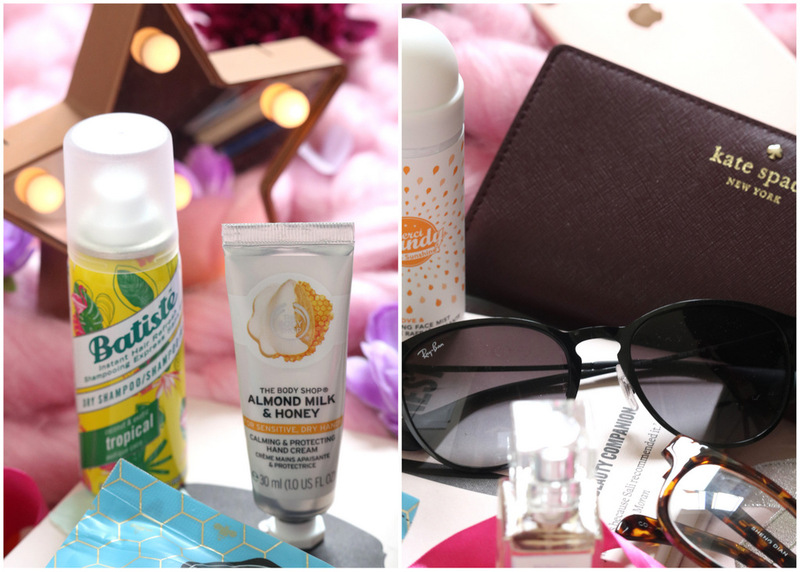 Summer is almost over so I wanted to share some of the products that I've been loving recently and a few new products! I'll also have a beauty favourites post coming soon with the products I've been loving over the past few months as I haven't posted a full favourites post for a while. Thanks to Joan Collins Cosmetics, Just My Look, No Bare Brows and Shadow Switch for the lovely products! Let's start with the foundation that I've been loving over the past couple of weeks, the *Joan Collins First Base Foundation (£25, 30ml) and I have the shade 'Cool Fair' which is one of, if not the lightest shade available. In the bottle, the foundation looks too dark for my incredibly pale skin but when blended it's a fairly good match especially when I set it with my amazing Milani Prep + Set + Go Powder. The coverage is light to medium, it has a skin like finish that doesn't emphasis dryness and it lasts well on me when set. I think it's a great everyday foundation, my only negative is that the shade range isn't light enough for me. Next up, the second most important product for me and that's a brow pencil! I didn't fill in my brows until I started blogging and now, if I don't fill them in, I feel naked almost. I've been using the *No Bare Brows Brow Pencil (£18) from Know Cosmetics for a couple of weeks now and I'm loving it! I don't just love the gorgeous packaging but it has a spoolie and sharpener on each end. The shade matches well, it's so quick and easy to use and it is just the right amount of creaminess and lasting power. I don't personally use the brow wax on the other end as I need a heavy duty brow gel but it's a good addition if you use brow wax. If you're looking for a super convenient, easy brow pencil then this one is well worth checking out. I've been using the *Real Techniques Core Collection (£13.75 - SALE) constantly since they were first released years ago. I bought two sets myself and now I have a third which is amazing as I use the buffing brush for my foundation every time I wear makeup and I also use the contour brush constantly. Real Techniques are some of the best brushes you can buy, I have a few MAC brushes but they aren't superior in any way to the Real Techniques brushes! Just My Look has quite a few sets to choose from and they are all at great prices! I think summer is the perfect time to bring out the highlighters and one I've wanted to try for a while is the *Sleek Makeup Highlighting Palette in Distorted Dream (£10.49) which contains five highlighting shades in one handy palette. They are pretty much colour correcting shades and they are very sheer so if you're looking for a glitter ball, intense highlighter then it might not be for you but I personally love the light cream highlighter for the summer. Another great highlighter is the *L.A Girl Pro Conceal HD Highlighter (£3.95) which comes in so many concealer shades as well as highlighting and colour correcting shades too. I have the white highlighter option which, if I'm honest, isn't the easiest to blend and I do prefer using a powder but it gives such a nice, subtle highlight. Sticking with the highlighter theme, this gorgeous *OPI Polish in Rosy Future (£7.90) is basically the nail polish version of a pink iridescent highlighter! The shade is very sheer but it adds a gorgeous pink and violet iridescent sheen to the nails which is a style of polish that I haven't tried for ages! I love the shade, it's long lasting and it applies so quickly. If there's one beauty task that I am very forgetful of, it's definitely washing my brushes! Thankfully, I now have the *Shadow Switch Dry Brush Cleaner (£5.99) which allows me to get more use out of my brushes before fully cleaning them. It's so quick and easy to use and allows me to go from shade to shade easily without having to use another brush. It's so cheap and it's well worth checking out if you use eyeshadow on a daily basis. Last but not least, I've been loving this *Laroc Beginners 120 Natural Eyeshadow Palette (£7.99) which is the largest palette I own! It contains so many shadows, of all shades with a range of finishes from matte to glitter. It has two trays, one of which you have to remove fully to use the second tray (which is the only thing I don't like about this palette). I've mainly been using the matte natural shades on a everyday basis but there are also a few shades that would be perfect for halloween which I honestly cannot wait for - I might start my halloween makeup tutorials easy this year! You can find some swatches of the products, as well as the palette, in the video below! Have you tried any of these products? What products have you been loving over the summer months? Last month I read the most I have ever read in one month which I'm so happy with! This month I read some great shorter books as well as War and Peace, I can't believe that I managed to read the gigantic beast that is War and Peace! For the month of July, I read 6 short(ish) books, four audiobooks and two longer books, one of which was over 1,200 pages! I love books set in Russia as well as books with a fairytale or folktale theme so this one fits the bills really well. It follows Matrona, who is an unmarried young woman who seems to be a cinderella style character until she unwittingly enters the mystical, odd world of Slava. Slava, another individual within the community who processes a dark and unusual secret...he makes and looks after dolls which replicate everyone in the community and that's all I'm going to say as it's nice to discover the story as you go. The writing was very quick and easy to read, I could have read it in one day and I did find the story on the whole very whimsical, sweet and interesting but I felt that it read like a YA book even though I can't find anywhere that says it is a YA book. I would recommend it if it sounds appealing to you but it was a little disappointing for me personally. I received a physical ARC from the lovely people at Pan Macmillan/Picador (thanks!). It follows a close knit family in the south of America who are struggling to get by and they're trying to travel north where they hope to have a better life away from the danger of war, rebel groups and impending bombs/fighting, sound familiar? I loved the writing, it was fairly quick to read and I liked the flipping from the present to the past which gave insights into how the world came to be as it is now including news articles and other snippets of information about the war. Throughout there's a sense of foreboding and a feeling that I didn't want to carry on as I knew it wouldn't end well because how could it? I found this book so heartbreaking, not just because the characters didn't deserve what happened to them, the awful scenes of war, death and torture or the futility of war and conflict but because these things do happen in our world, sadly it's not confined to fiction. I would definitely recommend this book as it's so devastating and heartbreaking but wonderfully written and touching. I do wish the ending was very different but life doesn't always have a happy ending, does it. I already have a full review of this book on my blog. I started reading the beast that is War and Peace this month which is over 1,200 pages...yeah. I've already posted my full review of War and Peace which you can read if you want a more in-depth review but I'll just say that for the most part it was surprisingly enjoyable and entertaining - I expected it to be very dry and boring but on the whole it definitely wasn't. However, the last 30% was difficult to get through for me and let the book down as it started to feel like a dull, slow history text book to me. I read With Malice by Eileen Cook last year and I really liked it as a contemporary mystery/thriller so when I saw her latest release, I knew I wanted to read it. It follows two friends who are graduating and hoping to move to New York, one of the main characters pretends to be psychic and reads tarot cards to her fellow students and she's dealing with a difficult home life and the lies she tells her best friend who is much more well off than her. That description makes it seem like a boring book but it is more of a revenge, mystery and contemporary thriller with quite a few twists and turns, only the last of which I saw coming. It was an incredibly quick read which is what I needed as I read it when I had an awful cold and throat infection. I didn't like it as much as With Malice and I felt as though it was a little boring at times and some of the characters decisions and the ending were a bit odd and didn't make much sense. Although I did like the mystery and twists, it just wasn't as good as I thought it would be - it's still worth checking out though! I was drawn to this book because of the gorgeous cover and the mentions in the description of fairytales, witchcraft and magical realism so I obviously wanted to read it and it turned out to be a really sweet, magical book. It follows the lives of a group of people in a couple of small rural villages particularly the Hedlight and Hinterland families through a series of tragedies involving an evil witch and a story of revenge, family, friendship and love ensue. It does have classic fairytale tropes but it was a fast, endearing read. I loved the magical realism in this book as well as the sweet characters and overall it was just a very charming and sweet story as well as being a extremely quick and easy read, although it wasn't amazing or anything really special. Apparently the author is a famous singer/song writer in Canada I think - I had no idea but I think it was a fairly good debut. I thought the illustrations would be similar to the cover illustration but sadly they aren't; the illustrations are very simplistic and I didn't think they matched up to the amazing cover illustration. This was the July read for The Girl Gang book club on twitter. The book is set in a near future dystopian America where most of the population is infertile and there are specific women, handmaids, who go from family to family, trying to conceive as babies are rare and coveted. In this world, they remember a time when there were women on the covers of magazines, makeup was common place, women had rights and freedoms and everything was normal, so it seems to be a not too distant future to our own. It follows Offred, her friends and fellow handmaids and the residents of the house she is assigned to. We hear her story from Offred herself in an almost diary or train of consciousness style narrative and there are glimpses of her past with her family and then her 'training' to become a handmaid. All of the handmaids long to become pregnant, by any means as otherwise they'll be either taken to anther family, will be cast out or if they break the rules, they'll be hanged or sent out to die with the outcasts of this broken, messed up society. Her story is one of desperation, submission, routine and loss with her fate hanging in the balance of her fertility, the people around her )particularly the commander) and the people she thinks she can trust as well as the almost cult like group of people who guard and enforce the rules over the handmaids, the aunts and guardians. To live in this world would be so terrifying with women being alluded to as slaves with the underground femaleroad and being nothing be vessels for reproduction with very few rights or liberties. I have read one book by Atwood previously, The Tent and really liked it and this book has more of her raw, overly descriptive and slightly meandering writing style which I do like but it was a bit much in this full length book. It was a quick and easy read and I wanted to know what would happen to Offred and Nick, the other handmaids and the society in general. While I liked the book on the whole, as we only get Offred's view it's a bit limited and I wanted to know more about the society as a whole and I wanted a full resolution which wasn't there. It's definitely more for adult readers and it does have some uncomfortable themes including suicide and some adult scenes but if you can handle that then it is worth a read, I just wanted more from it. I'm a big fan of illustrated non-fiction and funny graphic novels and this one is great! It's similar to the Sarah's Scribbles books so it was a little repetitive and familiar but I liked the simplistic, relatable illustrations from everything from dating, period problems and general clothing, beauty and seasonal problems and issues that women have to deal with. I'd recommend it, especially if you like the Sarah's Scribbles books. I find that with the majority of audiobooks, you have to concentrate and almost anxiously listen on but this was one of the most relaxing and almost calming audiobooks I've listened to. It's a part travel journal and part musings on various historic moments, monuments and objects around the UK including standing stones, roman roads, sun dials, bronze age mummies and their way of life and stone henge as well as stories about walking the countryside with friends and talks with others in museums. It wasn't what I was expecting which was a very factual history of ancient monuments but thankfully it was better as it was a relaxed journey around various ancient sites and discussions about ancient and historic monuments and objects. They only thing I didn't like about the audiobook was the narrator but if you are interested in archeology and history then definitely check out this audiobook! Whether we admit it or not, we are all to an extent interested in the dark sides of existence, the stories of murder, revenge and crime; I'm definitely interesting in watching and listening to audiobooks with those themes. This audiobook is a little long at around 15 hours but it was fairly quick to get through and I liked the narrator. The audiobook did feature a lot of case studies, most of which I knew or had heard something about such as Burke and Hare, Jack the Ripper and the murders in the red barn but there were some that I didn't know about. The audiobook had a lot of information about how literature was influenced and influential in terms of murder and crime detection fiction but the one thing that really annoyed me about this book was that it seemed to have SO many spoilers are classic books that I wanted to read - it really frustrated me and that's why it has such a low rating from me. The story takes place in a post apocalyptic world where there's a 'magician', feral children, biotech and a gigantic flying bear...yeah, it's very odd, unique and so wonderful. We follow Wick and Rachel who at the beginning of the story find a weird tiny creature in the fur of the flying bear that looks so odd and they don't know if it's dangerous or what it will do. Rachel names the creature Borne and over time it starts to grow and change and she starts teaching it about life in the Balcony Cliffs, an abandoned apartment block as well as life, stars, being human and more. Borne changes into a very unique creature with numerous eyes and tentacles but it can change into innumerable shapes and sizes. It follows the implications of keeping and teaching Borne, life during this apocalyptic world, we find out how to came to be and the life of both Wick and Rachel before the world went to s**t. I find the story so unique, interesting and very easy to follow. It won't be for everyone just because it's so odd as Annihilation was but it's worth checking out, especially the audiobook on BookBeat. I read Annihilation by Jeff Vandermeer last year and really liked it (although it wasn't as scary as it was made out to be) and I wanted to carry on with the trilogy in audiobook form instead. It's a relatively short audiobook, I personally didn't like the narrator and to be honest it was a little disappointing. It follows the aftermath of the previous book and follows Control and one of the main characters from the previous book (the biologist). I can't really say much about this book as it's the second in the trilogy but it involves a secret, wild area known as area X in which very strange things happen and all of the expeditions that go there end up dead and messed up. The majority of this audiobook was a little boring and a let down after the first book but I did find the ending was fantastic and now I'm onto the final book in the trilogy. Have you read any of these books? What are you currently reading or listening to? What is the longest book you've read? I always have my monthly reading wrap up posts but they are typically very long which is fantastic as it means that I've read a lot but it's maybe not the quickest or easiest post to read so for those books that I was sent a physical copy of or that I have a lot of opinions about, I'm going to have a separate mini book review of. Today's post is the first in this mini series which might only be once or twice a month, it depends on the books I'm sent and my opinions but today I'm talking about two books I was kindly sent physical copies of, one from Pushkin Press and the other from Headline Review via BookBridgr. I was very kindly sent this book by the incredibly lovely people over at Pushkin Press (surprise book mail is always very welcome!) and it sounded very interesting as well as something very different to anything else I've read. However, since I have loved every book I've read from Pushkin Press, I had to give it a go. I'm not crazy about the cover, I don't know if I would have picked it up of my own volition but I'm glad I was sent it as it was an interesting read as well as being very melancholy, raw and heartbreaking. We follow Jan, a virtuoso pianist, who at the beginning of the book is about to start a performance and going through post-performance nerves. As we progress through the book we go back into his past from being a teenager to his forties and as this book is very short at just over 200 pages, it's a bit of a rush through his life as he discovers himself, his sexuality, new people and relationships as well as his passion of music and a couple of heartbreaking revelations. I do like listening to classical and instrumental music but I'm not well versed in it so some of the mentions and references were lost on me but it was interesting and refreshing to read a book that is very different to anything else I've read. I read it in one sitting as it's so short and very quick to read. This is Eric Beck Rubins very foray into fiction which is impressive and I would recommend it if it sounds like something you'd be interested in but in my opinion, it won't be for everyone. I recently discovered the wonder that is BookBridgr where, if you are a reviewer or book blogger, you can request new titles to review; I requested this book and it arrived really quickly so thank you to the publisher! I adore the strange cover, it sounded so unique and I couldn't wait to read it even though it's longer than most books I pick up at over 500 pages but I did read War and Peace last month so this wasn't nearly as daunting! We follow the lives of the villagers and nobles of a coastal town during the 1300's where life is hard and it is about to get much worse with the outbreak of the plague, death of loved ones, unrequited love, religious cults, shipwrecks, hysteria and the more than unusual woman who is rescued from the sea...We follow numerous people with the village and manor, my favourite character was definitely Will who reminded me of Tyrion from Game of Thrones. This book to me felt as though it was set in the Game of Thrones world but focusing on a coastal village that we don't see. Even though this book is over 500 pages and it does follow numerous people, it is very easy to read and it's surprisingly quick, especially the last half of the book as I wanted to know what was going to happen, if certain characters would be reunited and what was ultimately going to happen to the village and it's inhabitants. I thought I was going to like this book, otherwise I wouldn't have requested it but I didn't know that I was going to love it. I now need to buy all of Karen Maitland's previous books as this was one of my favourite books of the year so far (I think The Owl Killers will be next on my list)! I didn't rate it five stars (although it was close!) as I felt at times that it was a little predictable and I wasn't surprised by what happened in the book; however there were some amazing but heartbreaking and disturbing scenes in the book that were written wonderfully. If you like dark, atmospheric historical fiction and mysteries then I'd definitely recommend this book! Have you read either of these books or anything from these authors? What are you currently reading?